Fungicide resistance or reduced efficacy is a concern when managing peanut diseases, especially the foliar diseases early and late leaf spot. Managing these concerns requires an integrated approach with constant monitoring of the product’s efficacy and application programs to avoid resistance selection. Two common resistance management strategies are alternating (or rotating) and mixing fungicide product modes of action (MOA). It has been indicated that MOA mixtures are a more sustainable strategy for resistance management than alternating, but they may be costlier as they tend to increase the spray program’s number of fungicides. So, it is important to understand the value of these two strategies especially when using products that have a moderate to high risk for resistance selection. A recent study explored the value of these strategies using the fungicide products azoxystrobin (Abound 2.08), pyraclostrobin (Headline 250 SC) and tebuconazole (TebuStar 3.6L). All these products are off patent and considered medium to high risk for leaf spot resistance or reduced sensitivity. The study consisted of various spray programs that had five applications of chlorothalonil (Chloronil 720) at 30, 44, 72, 100 and 114 days after planting (DAP). The at-risk products were then applied at approximately 58 and 86 DAP either alone (alternation program) or in combination with chlorothalonil (mixture program). 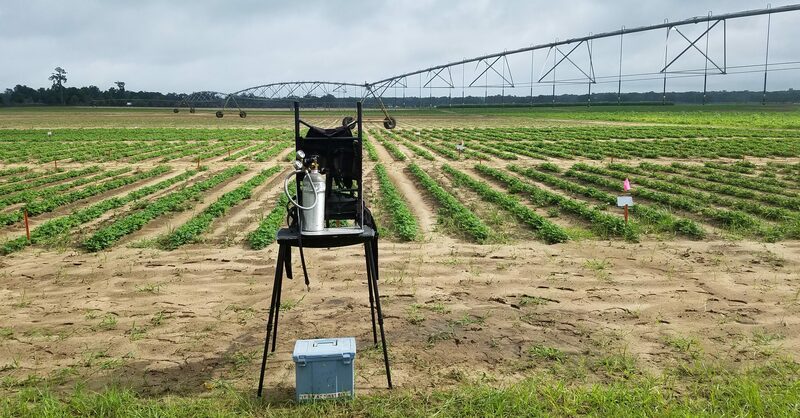 The study was conducted at two locations in Marianna and Citra, FL during the 2017 season. The mixture programs generally had higher yields than the alternation programs (4 times out of 6), however, only one of these yields was significantly different (Fig 1). Both strategies provide significant yield savings compared to the untreated control plots (data not shown). Figure 1. Yield results from the various fungicide alternation and mixture programs at the two locations. Fungicide products consisted of azoxystrobin, pyraclostrobin, tebuconazole and chlorothalonil. All programs consisted of 5 applications of chlorothalonil with the products indicated on the x-axis applied alone or in combination with chlorothalonil at 58 and 56 days after planting. 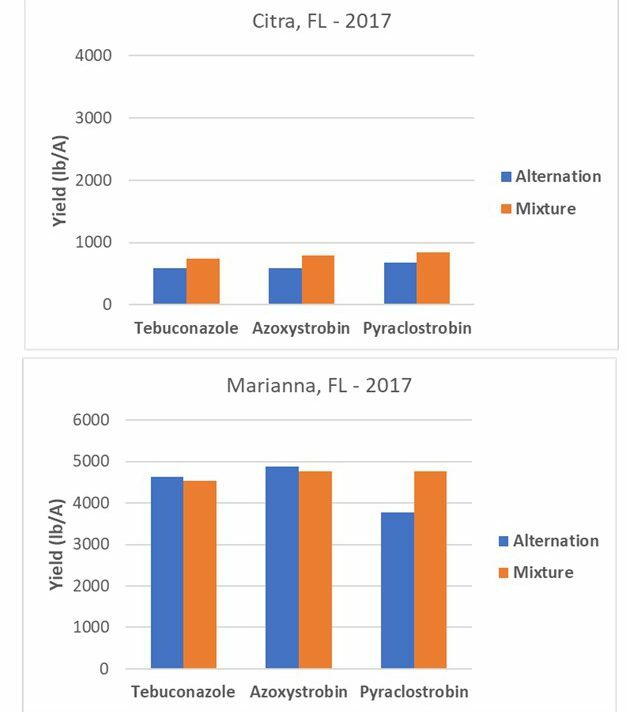 The yield was significantly greater for the mixture program compared to the alternation in the pyraclostrobin treatments for the Marianna location. Identifying the pathogen population present is a key component when assessing these two strategies. 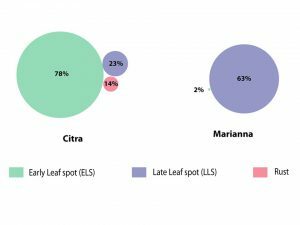 Location populations varied with late leaf spot being the primary pathogen in Marianna, and early leaf spot in Citra (Fig. 2). It is also important to note that significant pressure was also present from late leaf spot and rust in Citra as well. This variation in pathogen population could be one possible reason for the inconsistencies observed between these strategies at each location. It does seem apparent that in situations where multiple pathogens are present that alternations are not as effective as mixtures. Figure 2. 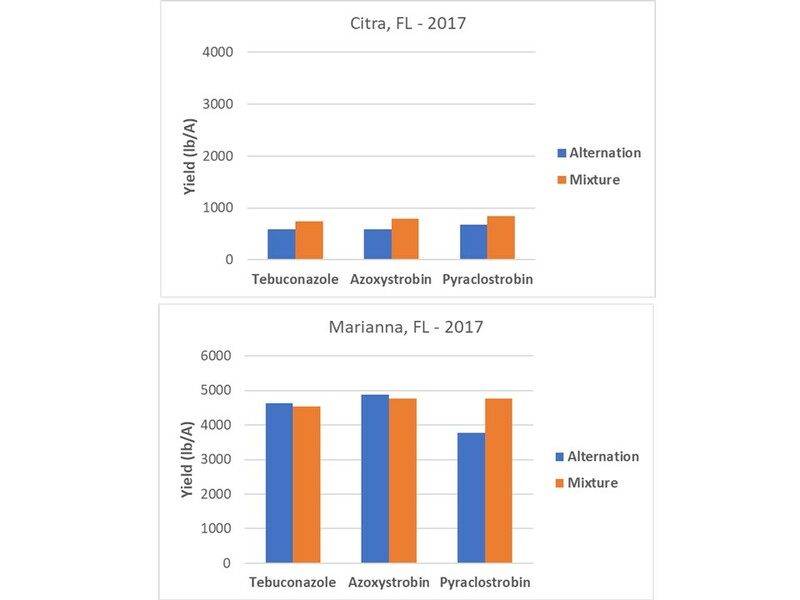 Disease incidence percentages in the untreated control treatments for Citra and Marianna, FL. Early leaf spot, late leaf spot, and rust were rated separately on leaflet samples (48 leaflets/treatment). Disease incidence shown represents average seasonal incidence recorded in the locations during 2017. Mixing fungicide MOA appears to be the optimal strategy for disease control, yield savings and managing fungicide resistance. However, alternating MOA is also a successful strategy, but its efficacy appears to be highly dependent on the pathogen populations present. Regardless of the strategy chosen, disease control and yield savings were improved with these strategies compared to the untreated plots. Both strategies will help sustain the efficacy of a fungicide product, and if cost is an issue then alternating modes of action in a program is better than repeated applications of a product alone. It should be noted that when using generic products like these, the average cost only varied by approximately $2.50 per acre. The cost of mixtures will depend largely on the mixing partners used, and with some planning these costs can be minimized. Fungicide resistance management should be an important component of any peanut disease management program. More information about fungicide resistance and its management can be found in this UF/IFAS publication, Fungicide Resistance Action Committee’s (FRAC) Classification Scheme of Fungicides According to Mode of Action, or by contacting your local extension office.